The semi is the go to truck for big loads. With a 53′ tri-axle flatdeck capable of hauling 62,000 pounds, we can deliver the largest deliveries the customer can order. Our trailer also hauls 1 of 3 moffetts so we can forklift loads right off the trailer and drop them where you need. 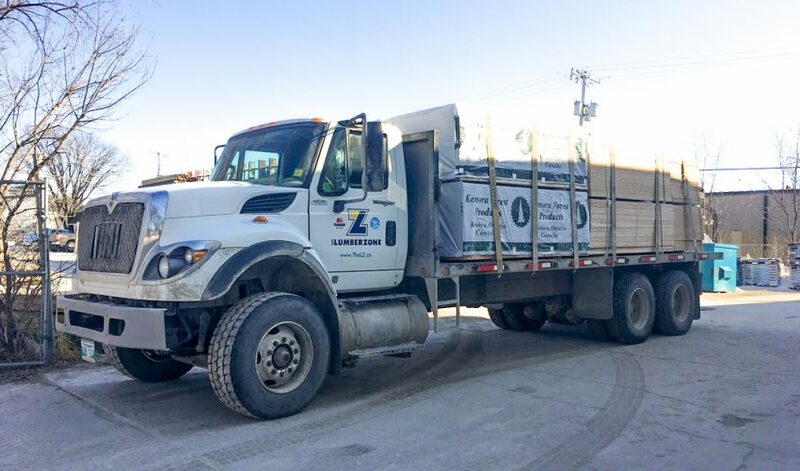 Whether it’s a full house package or a load of Insulated Concrete Forms with rebar, our semi can handle your largest requests. Give us a call today and get our expert drivers to bring your load out to your job site. 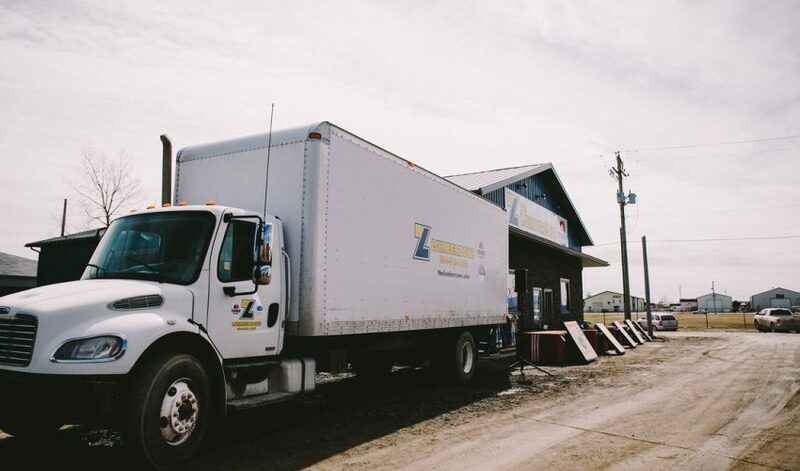 A 26′ cube van that specializes in pickups and transferring product from our Steinbach Distribution Warehouse to our three stores all over Manitoba. 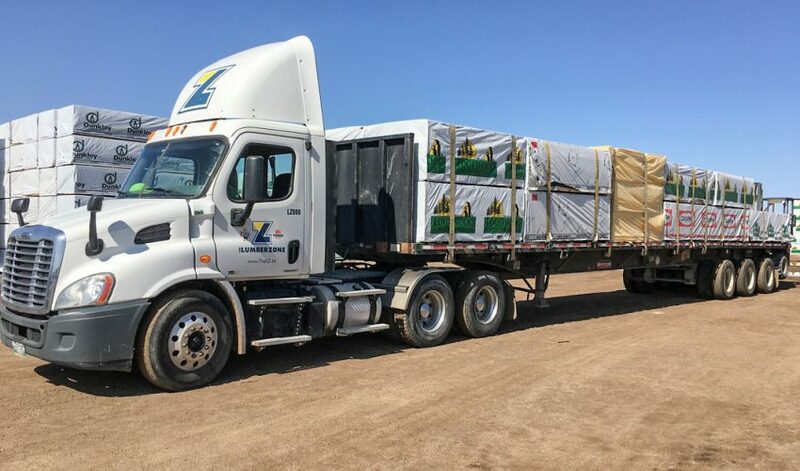 This International tandem can haul nearly 35,000 pounds of material, and with 1 of 3 LZ moffett forklifts in tow we put the product where you need it on site. 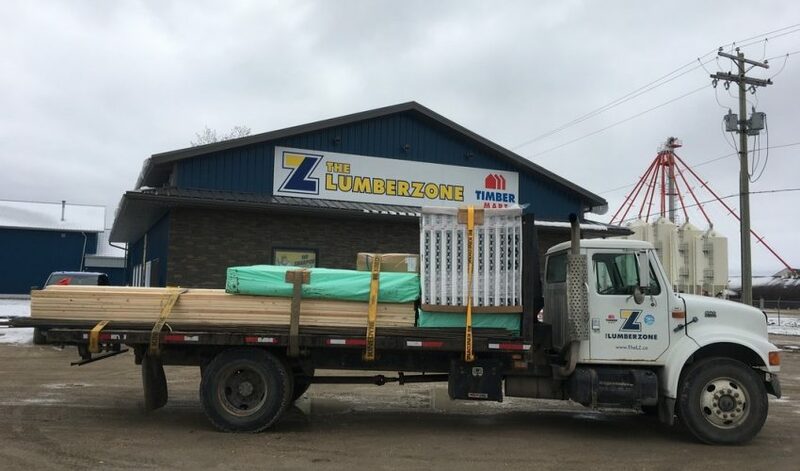 His favorite thing to deliver is large deck packages being built with Micro Pro Sienna or Trex decking which are both specialties at The LumberZone’s 3 locations. We added to the fleet in March 2018 to help The LZ maintain the level of service that our customers expect. 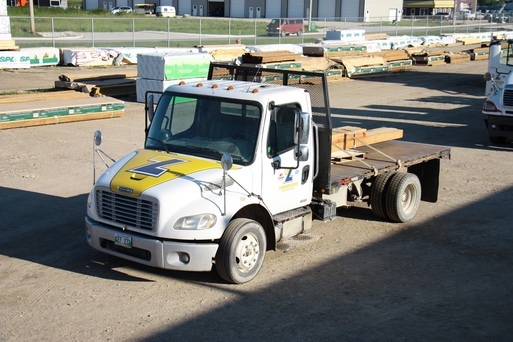 This 5 tonne truck with its tag along forklift can haul 20,000 pounds of lumber, drywall, composite decking, interior finishing etc. The most versatile of our fleet is the boom truck. Whether you need shingles craned right onto your roof, or drywall into a second or third story, our experienced boom operator can do it all. With a maximum reach of 50 feet into the air you’ll be amazed at how much easier it is to shingle a roof when you don’t have to carry the shingles up a ladder. We ensure a safe and well-spread delivery on every roof. Don’t injure your back carrying drywall up a flight of stairs, why not just get us to bring it right up to a second-floor window and drop it in the house! Our state of the art boom truck is ready to serve your every need. ​We doubled down with a second boom truck in the spring of 2018. 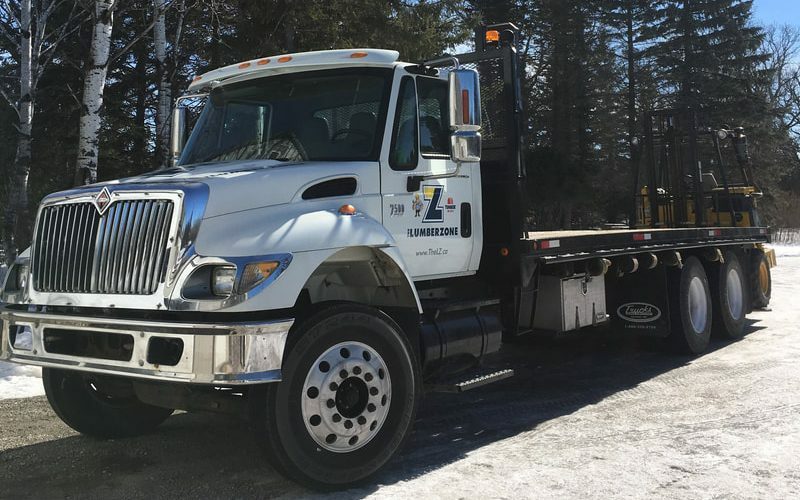 The ability we have with two boom trucks to service our customers in the drywall, insulation and shingle game is exponentially improved with this addition to our fleet. 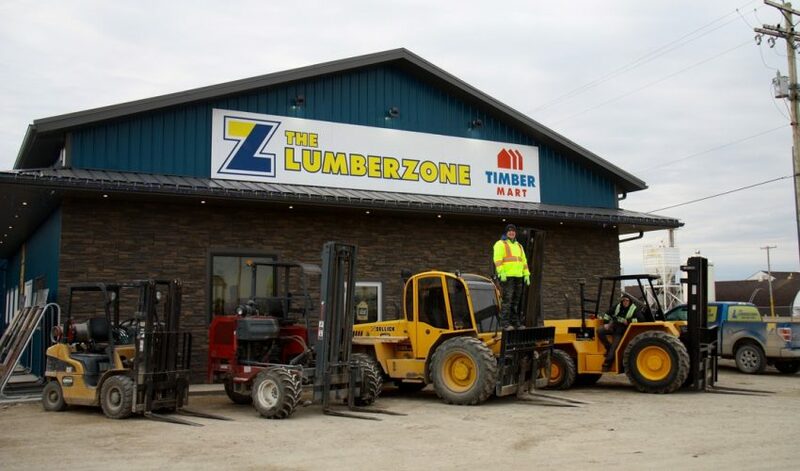 And with a 25,000 sq/ft storage facility in Steinbach stocked with truck loads of drywall, insulation (Rockwool and Owens Corning) as well as cellulose we are the people you want to call for quality service and the best quality products. 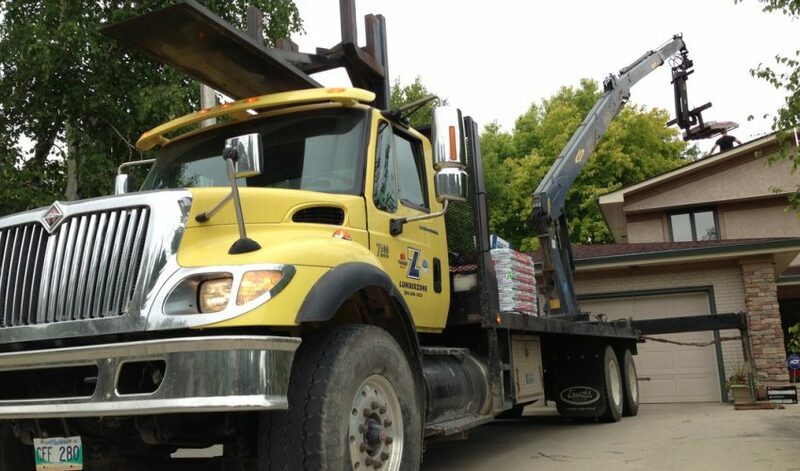 Both of our boom trucks will travel delivering drywall and shingles from Halbstadt to Gimli and Treherne to Falcon Lake. 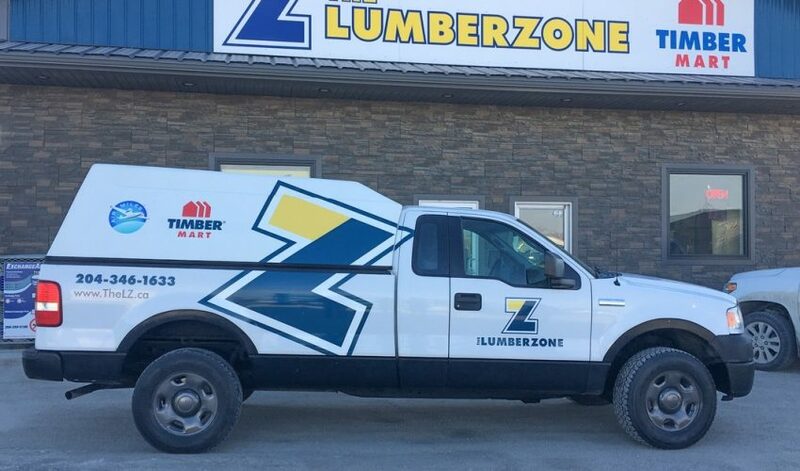 The LumberZone’s trademark and most photogenic truck boasts a 2.5 ton capacity with a hydraulic dump on the back. 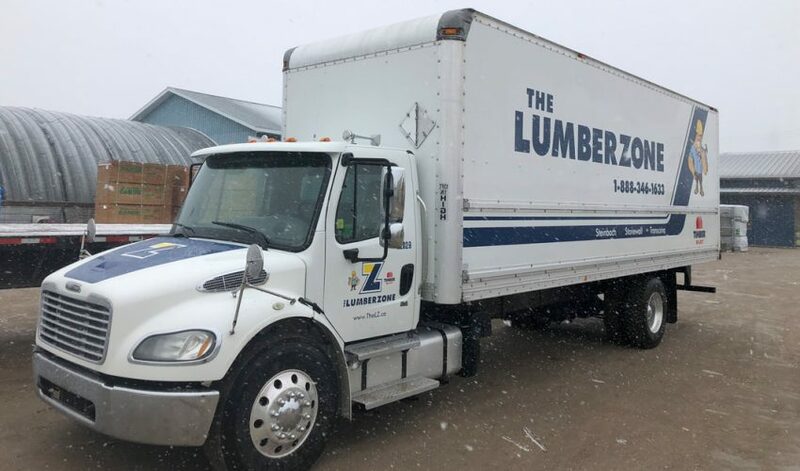 This is the little truck that can; The LumberZone’s Workhorse! If you need a smaller package delivered in town this is the truck for the job. We can get right into your driveway and expertly place the product right where you need it. And how can you miss that hood? Our 16’ F550 is great for delivering products into tight spaces. With our company decals it is a sleek looking vehicle and great for parades and community events. It’s built Ford Tough so your product arrives on time as scheduled. Need a delivery that can’t get wet? Our 24′ long cube van is ready to handle your orders. Whether it is interior doors or softener salt, we can do it. Almost old enough to be a classic this 1999 International 3 tonne received an engine rebuild in May 2017, shortly after being purchased by The LumberZone. 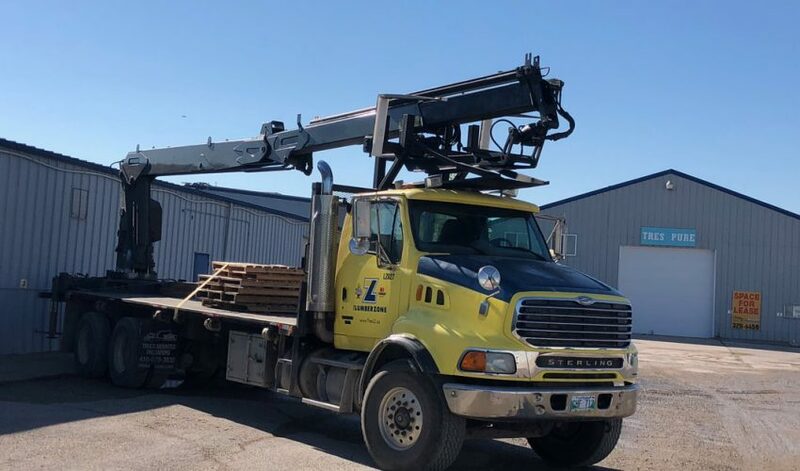 With a 19′ deck it easily delivers rebar, composite decking, interior finishing, as well as pizza to the jobsite (if pizza is what you desire to help get your work done quicker). 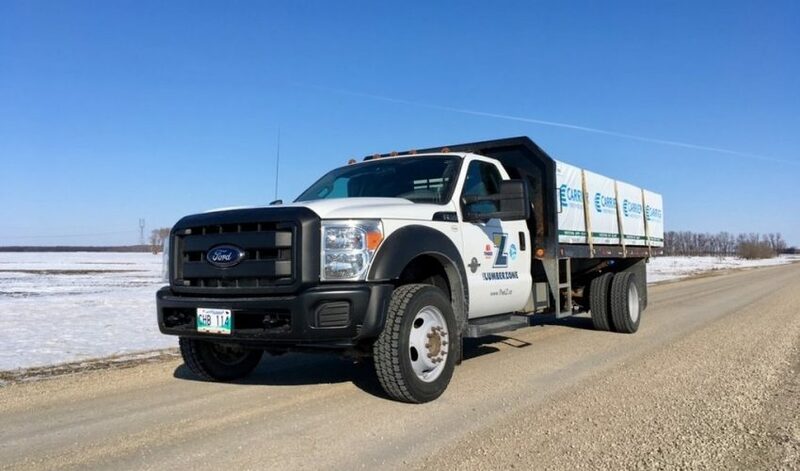 You will see this truck on the road between Steinbach and Stonewall, Transcona and Tyndall, Arborg and Anola. Call toll free 1-888-346-1633 to book your next delivery. Stormchaser, our deckover trailer is perfect for those small loads in town. Since we can pull this guy around with our half tonnes, deliveries go quickly and efficiently. Plus the electric blue colour is the perfect match to our other trucks! The white knight specializes in visiting job sites with everyone’s favourite calories. (ie donuts, coffee) It also gets your small last minute deliveries to the job site quickly. 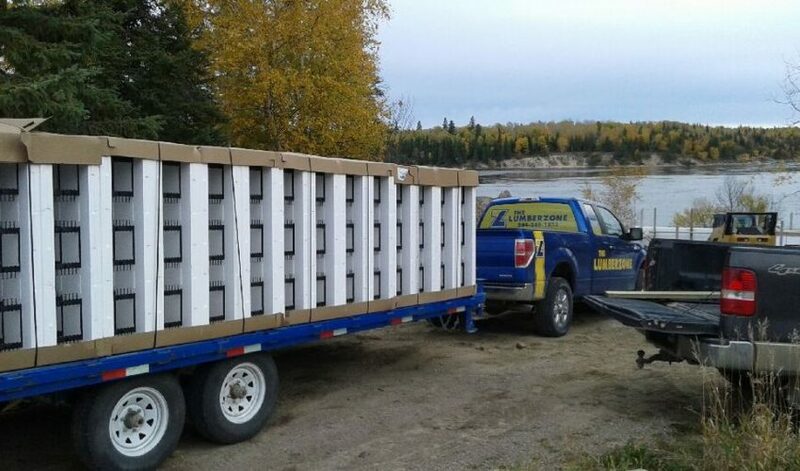 Need an extension cord, boxes of nails, some drywall mud……The White Knight is here to get items to the job site so you can stay working at the job site. © The LumberZone 2019. Site by Print Studio One | Three-Six North Marketing.